In a previous issue of Sun Magazine was an interview with Studs Terkel. Terkel has written several books that are essentially an oral history of the United states in the last half of the 20th century. His famous book, Working: People Talk About What They Do All Day and How They Feel About What They Do chronicled the daily work lives of ordinary people. And his 1984 book, The Good War: An Oral History of World War II won the Pulitzer Prize. Terkel is an American icon who has put his heart and soul into his life’s work. And Studs Terkel also makes mistakes. Sun: Have you ever lost an interview because of a technical problem? Terkel: Sure. I’m known for my ineptitude. That’s the irony of the whole thing; they call me the “master of the tape recorder,” but I haven’t the faintest idea of what I’m doing. I’m just learning the electric typewriter. And I don’t know what a computer is. You’ve got neocons and neoliberals: I’m a neo-Neanderthal. When I think of all the technical mistakes I’ve made in my business, not to mention a zillion other small and not-so-small mistakes, it’s nice to be reminded that you don’t have to be perfect to be successful and to make a difference. I’ve noticed that one of the biggest things stopping people from marketing themselves is obsessing about “doing it right.” But I have the opposite advice: Do it wrong. Just try something and, like Studs Terkel, sooner or later you’ll figure it out. These imperfections or small mistakes will rarely sink a business. But getting so stuck in preparation that you never get started kills businesses every single day. In my Fast Track Marketing Model, I emphasize seven big things you need to focus on in order to market effectively. Miss doing these and you’re in deep trouble. And miss them we do, because we’re too focused on the sharks. In our marketing, we worry about trivial things when we need to focus on the bigger picture. We need to develop a marketing mindset that is focused on making a difference instead of worrying about rejection. >> RELATED: Is Kendall Jenner Losing the Kardashian Touch? Instead of complaining how we can’t find time to market or how our services are hard to explain, we need to adopt the mindset of the master marketers. My services are valuable. I will do what it takes to get the attention and interest of my prospects until they see the value as well. Whenever you play a game you make mistakes. That’s just part of the game. You drop the ball. You miss the goal. It’s not a big deal, you just keep playing the best you can. The big mistake we make in marketing is either not playing the game at all or not realizing that there even is a game. I see a lot of Independent Professionals running around the field with no idea who has the ball or where the goal is. You need to understand the rules of the game and then commit to playing it to win. It becomes a lot more fun when you do. The bottom line of marketing is communication. It’s saying the right things at the right time to the right people. But obsessing about the perfect word is not very productive. Like the game of marketing, many of us don’t even realize that there’s a language or syntax you need to employ to get attention and interest from prospects. Talk about who you work with, the problems they have and the solutions you offer and the words will take care of themselves. One thing that still amazes me is how people obsess about their marketing message or “Audio Logo” but never try it out on real, live prospects. A marketing message only makes sense in the context of an interaction or written communication with a prospect. Did they show interest? Did they respond? Try out your marketing message on 50 people and you’ll know if your message is working or not. Then fine tune. If people obsess about marketing messages, they agonize overwritten marketing communications. Is that the perfect word? What if there’s a typo? What if I say if wrong? But what we miss is the big picture of marketing communications – getting something out on a regular basis to prospects on your list. That builds credibility through visibility, even if you make a typo here and there. Just ask yourself: What information would help my prospects? And then make it a priority to get it to them. There are probably hundreds of different marketing tactics you could use to market yourself. From networking to television ads. What’s the perfect tactic for your business? How can you know? Guess what? There is no perfect tactic. So don’t get caught in paralysis by analysis. Pick a tactic that you would actually enjoy doing and jump in with both feet. My favorite tactics involve very direct communication with my prospects. I get them interested; I offer something of value; I ask for a response; I follow up and ask for the business. Ever notice how the same ideas tend to re-circulate in your brain over and over again? We don’t take action because our plan never becomes real. Again, worried about making a mistake, we do nothing. You don’t figure out your whole marketing plan and then write it down. In the process of writing it down, the plan becomes clearer and clearer. What’s your goal, what are you going to do, when are you going to do it and what resources to you need? Then start. The More Clients Bottom Line: Don’t let yourself be stopped by worrying about little mistakes. They’ll happen despite our best efforts. 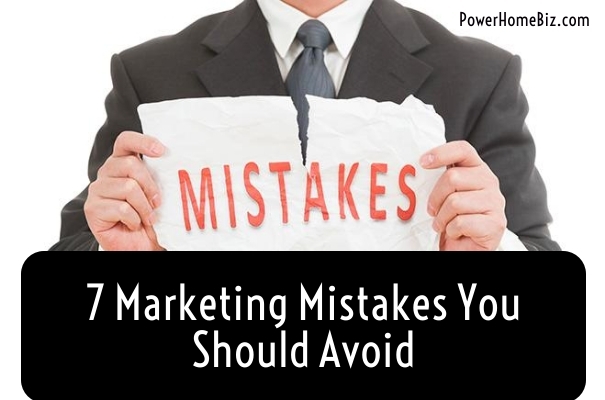 Put your focus on avoiding the big mistakes and your marketing effectiveness will expand dramatically.